Like all niches of the auto hobby, off-roading is an activity enjoyed by countless enthusiasts and families all over the country. 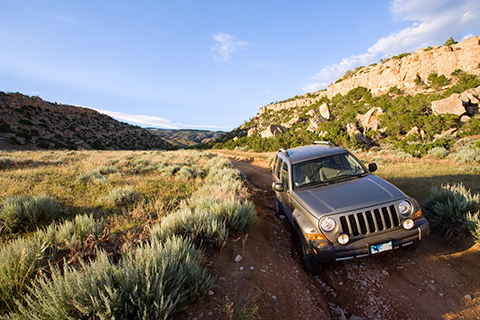 Responsible use of OHVs (off- highway vehicles) allows off-roaders to enjoy all that America's landscape has to offer on two or four wheels. However, with increasing frequency, enthusiasts are encountering "road closed" signs on public lands. This is often the result of the U.S. Congress passing legislation establishing "wilderness" areas. A wilderness designation is the strictest form of public land management since virtually all mechanized equipment is outlawed. Motorized recreation is not permitted on these lands. In fact, allowable use wilderness areas only includes travel on foot or horseback-without the luxury of toilets, tables or fire pits. Wilderness does serve an important environmental purpose in protecting plants and animals and America's natural heritage. The issue is the amount of land that needs such a restrictive designation and whether it is possible to permit some motorized activities on portions of the land. When Congress enacted the Wilderness Act in 1964, it set aside 9 million acres of land. There are now about 110 million acres. However, there are some OHV-friendly compromises that can be pursued. For example, reasonable limits should be placed on the amount of acreage to be designated. Existing roads and trails should be "cherry-stemmed" so that they do not receive the wilderness stamp. Congress should also consider enacting new "back country" designations - not as drastic as wilderness - that would permit motorized activity on certain lands while simultaneously protecting the environment. In recent years, anti-OHV activists have pushed dozens of wilderness bills in an organized effort to lock-up as much land as possible. When these bills are rushed through Congress, there is little opportunity to cherry-stem existing roads and trails. In fact, the wilderness designation may be an intentional means to force responsible OHV enthusiasts off public land. This hurts local economies that depend on off-road activities and deprives enthusiasts of legitimate recreational opportunities. In 2009, Congress combined more than 160 separate wilderness measures into one larger bill called the Omnibus Public Land Management Act. The law created nearly 2.2 million acres of new wilderness in nine states, including areas in and around Joshua Tree National Park and the Eastern Sierras in California, Owyhee-Bruneau Canyonlands in Idaho, Mt. Hood in Oregon, Zion National Park in Utah, Sabinoso Wilderness in New Mexico and Monongahela National Forest in West Virginia. Many roads and trails were swept-up in the closures including Mt. Canaan Trail in Utah and Dickshooter Ridge Road in Idaho. Congress continues to consider dozens more wilderness measures which could encompass additional millions of acres of land across the country! Scores of popular OHV trails could be closed. It is more important than ever to get involved and make your voice heard by government. Joining the SEMA Action Network (SAN) at www.semasan.com is an excellent first step. The SEMA Action Network (SAN) is a nationwide partnership of vehicle clubs, enthusiasts and members of the specialty auto parts industry who volunteer to protect their hobby from unreasonable laws and regulations. Founded in 1997, the SAN has over 65,000 individual and car club members throughout the United States and Canada and is in direct contact with millions of enthusiasts through electronic communication, publications and social media. Implementing OHV policies that recognize the importance of vehicle-oriented recreation. Conducting case-by-case reviews of lands subject to a wilderness designation to ensure widespread local community support, and releasing any lands that do not meet the wilderness criteria since they have been developed with roads, trails, buildings, etc. Cherry-stemming existing roads/trails, a process that excludes them from the wilderness area and, thereby, remain open to recreation.